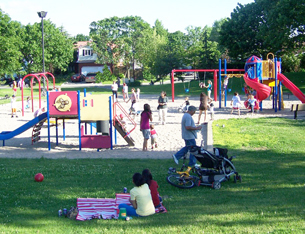 The Town of Kirkland has close to thirty parks with safe and fun playground equipment for Kirkland families to enjoy. Some parks also make it possible for you to practice different sports activities in summer and winter time. Parks and play areas are open to the public from 8:30 am to 11:00 pm, 7 days a week. Visitors are prohibited from bringing animals into the park, lighting fires, playing golf, target shooting or hunting, bringing bottles or other glass objects, drinking alcohol or disturbing the peace. Vandalism – Calling upon all residents! The Town of Kirkland is very proud of its many parks and green spaces and deploys all the necessary efforts to maintaining them. However, over the course of the past few summers, some parks continue to suffer repeated degradation at the hands of vandals. Structures have been burnt, cut with knives, had bolts removed damaging the integrity of the equipment and causing safety hazards, and been literally covered with graffiti. Town employees take their job very seriously, and spend immeasurable hours in researching, conceptualizing, and designing these play areas in order to maximize their play value to our children. It is becoming increasingly discouraging to see the fruits of our efforts treated with such disrespect. Every effort is constantly made to provide functional, attractive playgrounds and the senseless, irresponsible acts of a few, turn these efforts into a continual battle. As residents of our Town, you can help. Educate your children about the negative effects of vandalism. If you live near a park, be vigilant - if you see activities going on that don't belong in a park, and could lead to property damage, call the Public Security at 514 630-1234. These are your community parks; help us to ensure that they remain the best of all possible play areas for our children.